The struggling retailer seeks bankruptcy protection after more than a century as an American icon. The filing for the Hoffman Estates, Ill.-based department store owner comes ahead of a looming debt repayment due later Monday and just after the chain added restructuring expert Alan J. Carr to its board of directors. It reportedly had started missing payments to vendors, sparking concerns about its future. M-III Partners LLC is the retailer's financial adviser, and Lazard Ltd. is its investment banker. Weil, Gotshal & Manges LLP is debtor counsel. Sears shares have plummeted this year, closing at 40 cents on Friday, Oct. 12. The company started 2018 above the $3.50 per share mark and was above $6.20 per share in October 2017. Sears, its lenders and CEO, chairman, controlling shareholder and lead creditor Eddie Lampert had reportedly been kicking around a number of different options before the filing. In its filing on Monday, Sears said Lampert has stepped down as CEO but will remain chairman. The company has created an Office of the CEO that will run day-to-day operations during the bankruptcy process. Sears said it will close 142 unprofitable stores near the end of the year, which are in addition to the previously announced closings of 46 unprofitable stores that are expected to be completed by November. It reached a deal with lenders to will allow hundreds of its stores to remain open for now. Sears had an out-of-court restructuring proposal from Lampert on the table, but it reportedly had trouble getting creditors on board. The retailer had also reportedly proposed shrinking its store base dramatically, after years of paring its locations, but some lenders pushed for a liquidation. What Does Bankruptcy Filing Mean for Sears Gift Cards and Extended Warranties? 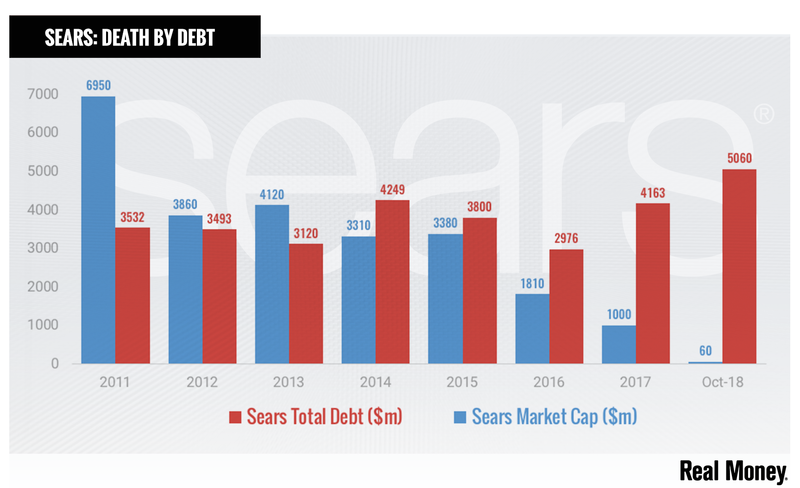 Lampert, for his part, reportedly refused to help satisfy the latest debt repayment but was said to be considering acquiring certain Sears assets in bankruptcy, potentially using debt he holds instead of cash in what's known as a credit bid. The restructuring plan from Lampert's ESL Investments Inc. included the sale of its encumbered real estate portfolio and debt swaps with second-lien and unsecured creditors, a move the hedge fund said would reduce the department store chain's current $5.6 billion in debt to about $1.2 billion, cut annual interest expense by $33 million to $88 million and extend debt maturities. A special committee of independent directors, which had been overseeing a sale process for certain Sears assets that ESL previously offered to purchase, considered the latest proposal as well. ESL in August offered to acquire the Kenmore brand for $400 million and the Sears Home Improvement Products business for $70 million, plus a potential $10 million contingent payment. In April ESL had proposed acquiring the SHIP unit and Parts Direct appliance division for $500 million and Sears divesting Kenmore. The company's lenders who were reportedly pushing for liquidation include Bank of America NA, Citibank NA, Citizens Business Capital, PNC Bank NA, Regions Bank and Wells Fargo Bank NA. According to Sears' most recent financial report, Lampert, who controls 49% of Sears shares before exercise of warrants or debt conversion, also controls at least $2.39 billion in debt, including $45 million in second-lien loans due Monday. Some $89 million in 6.625% junior secured notes were due the same day. Founded in 1886, Sears grew to be the model for the industry, in many respects the Amazon.com Inc. (AMZN - Get Report) of its day. An American icon, Sears once sold everything from baby bottles and toys to prefab houses and car parts. Its 500-page-plus mail-order general-merchandise catalog, which lasted until 1993, was long a lifeline to everyday items for rural customers. Hedge fund manager Lampert began to assemble what would become Sears Holdings in May 2003 by buying Kmart (then a separate company) out of bankruptcy through the conversion of debt holdings into equity. The following year, Kmart bought Sears for $11.5 billion and combined the two to form Sears Holdings. The combined company, however, has struggled in recent years, with shares now down to pennies after touching a high of $115.37 in early 2007. Critics charged Sears with not investing in its stores and struggling to change in response to new competition from Amazon and others while at the same time acknowledging Lampert's continued commitment to the company through his millions of dollars in investments and monetization of assets. Sears has closed thousands of stores and laid off legions of long-time employees, most recently saying in August it would close 46 unprofitable stores in November. Sears operated 866 locations as of Aug. 4, down from 1,725 at year-end 2014 and 2,429 a year earlier. Meanwhile, the bad news for Sears caused some suppliers to shun it, while sliding sales led to a need to raise massive debt to stay alive -- money often coming at high interest rates from Lampert's ESL. The drumbeat of bad news led to downgrades at ratings agencies and widespread speculation of when a bankruptcy filing could come for Sears, with restructuring attorney Brian Davidoff of Greenberg Glusker Fields Claman & Machtinger LLP telling The Street in January: "Sears is at a break point. If there is a [bankruptcy] filing, that filing is likely to occur this year." The same month, David Tawil, president of distress-focused hedge fund Maglan Capital told TheStreet, "Lampert definitely gets the prize for pulling off the greatest liquidation in history." Sears reported a $508 million net loss, or $4.68 per share, on $3.18 billion in revenue for the quarter ended Aug. 4. The retailer reported it had $193 million in cash and equivalents. Same-stores sales dropped 3.9% year over year in the most recent quarter.